Jeongeun Choi is a UK and South Korea-based film writer-director. Her feature film in development, THE GO-BETWEEN, is shortlisted for the BBC Writersroom Drama Room 2018 as well as selected for PLOT Script Lab 2019 in Portugal. Her central themes and genres vary from love, loss, human fallibility, inequality, euthanasia, sci-fi, historical drama to climate change, yet she embraces humanising her characters and stories with an intimate and progressive filmmaking lens. Jeongeun has received 'Special Mention' film award at Riga International Short Film Festival 2013! The closing ceremony was held in central Riga on the 26th October. The festival hosted lectures and exhibitions, theater and music performances, “out-of-the-box” events as well as other activities within the rich city environment. The festival invited film directors, VJs, lecturers, jury members and collaboration partners from a number of different countries to take part in the event. 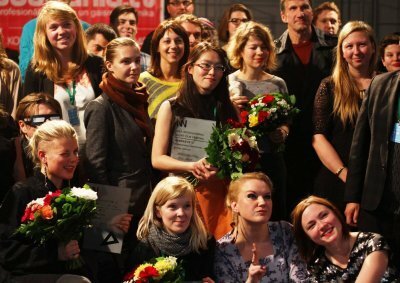 The film festival drew large crowds of visitors, most of which were filmmakers, artists and students from the Baltic States and many other European countries. Spare will be screened at the next SHORTFILM at the Troubadour on 24 June, Monday 7:30-Midnight. Since 1954, the famous Troubadour Club has been a hotbed of emerging talent and a leading light in excellent musicianship and live music. From its early incarnation as a folk venue, and counter-culture den of creativity, The Troubadour Club has remained at the forefront of interesting, original music and spoken word events with a great reputation for originality and atmosphere. Jeongeun is selected to be the participiant at this year of ESFS. The European Summer Film School (ESFS) is celebrating the 65th anniversary of the foundation of the Faculty of Dramatic Arts in Belgrade. It had opened a contest for this year’s film students’ workshop. The holding of Film Schools is an occasion for between 8 and 12 film students from around the world to gather in Belgrade and listen to personal film experiences of renowned and active filmmakers, mostly coming from Southeast Europe. With the support of a mentor and under a topic of his/her choosing, international and students of the Faculty of Dramatic Arts in Belgrade join hands to shoot short and simple film exercises. At the award ceremony, Spare was nominated for Best Experimental! Jeongeun's London Film School graduation film ‘I'd do the Laundry, You'd do the Dishes’, has finished filming in London. It was shot in various locations, north London and tested the patience and generosity of many friends, relatives and neighbours, to all of whom we’re extremely grateful. Each of the crew, mainly from LFS, and actors showed a humbling degree of dedication, energy and cooperation on what were some extremely testing days and nights. We’re extremely excited about the footage that Darren Joe, our talented DP, has captured. Jeongeun is aiming to finish post production in January 2013. Please visit indiegogo.com/EasyAsItSeems for more information. Our warmest thanks again to everyone involved. Jeongeun's two short films, she worked on as a Director of Photography, were selected for four film festivals in this autumn. The Things I See, directed by Shirley Bruno, will be playing at the Trinidad & Tobago Film Festival in the Caribbean, Reel Sisters of Diaspora Film Fest in New York City, and the Cornwall Film Festival, UK. And Insight: A Cinepoem About Vision, directed by Jacqueline Lentzou, will be playing at London Greek Film Festival. Both of two films were the London Film School Projects and the three filmmakers all worked together, switching the roles and sharing their creativities for the two films. Insight: A Cinepoem about Vision won Best Experimental at the London Greek Film Festival! Rise Above will be screened as a part of Korean Film Council's showcase on the 22nd of August. There will be the screenings of 12 films, all funded by Korean film Council, at IndiePlus in Seoul, South Korea. Distributors and film industry professionals will be invited and also filmmakers will be guided as to how they can improve their chances of screenings in film festivals for the future. Jeongeun launched her campaign so as to raise funds for her upcoming project, Easy As It Seems on Indiegogo. Easy As It Seems is a relationship study in which a couple move in together and engage in a spot of flat-packed furniture assembly. In time, it turns out neither co-habiting nor furniture-building is as easy as it seems! Easy As It Seems is currently in pre-production and she is looking for funding. Please visit indiegogo.com/EasyAsItSeems for more information on the film, how to donate, and what you will receive in return. At the beginning of Rise Above, we follow Hyeoncheol, a young man who visits Jeju island and finds it is not welcoming to him. Later, we meet Yeongok, an older woman who lives in Jeju and has never met nor heard about Hyeoncheol. 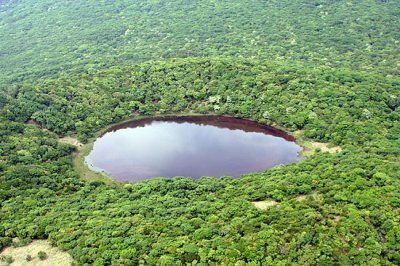 Together they make an ascent of Saraoreum, a volcanic mountain with a lake at the summit. As they climb, the tension between them grows and the reason for their awkward meeting slowly becomes clear. Rise Above is about two very different people who, despite uncomfortable circumstances, find affinity in one another in through a shared experience. Rise Above is funded by The Korean Film Council and The Jeju Film Commission and also sponsored by Peerless Camera Company and Dragon DI. 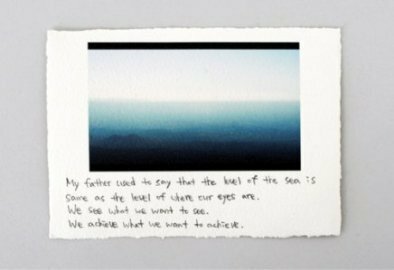 Jeongeun's postcard work and her words of wisdom now on the W project Blog. What are your words of wisdom and why? I grew up in Jeju, which is a volcanic island off the south-west coast of Korea. When I was little, my father used to say that the horizon of the sea is always the same as the level of our eyes, no matter where we are standing. I took this to mean that we simply see what we want to see, and since then, I was fascinated by the different levels of the horizon depending on where my eyes are. Since first being invited to participate in the inaugural W Project in 2011, I pushed myself hard and I achieved what I wanted to achieve. I want to share my words of wisdom with other people who will see what they want to see, and achieve what they want to achieve. 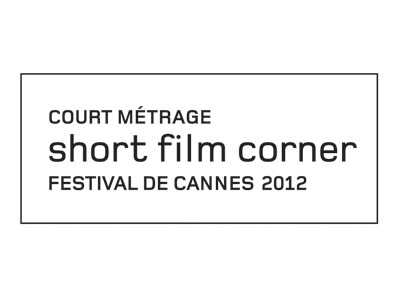 Jeongeun joins The Short Film Corner organized by the Festival de Cannes 2012, with her recent work, Rise Above. The Short Film Corner is a place to present short film producer and director's films and make meetings reality and take decisive steps for their future careers. Short filmmakers have a chance to develop the international network of contacts or finding additional financing, as well as optimizing the promotion and distribution of their film through. Jeongeun colloaborated with a Korean painter, Mi Young Cho, who is jeongeun's Korean painting teacher and also old friend. For Rise Above, Jeongeun chose a painting for the opening titles, One day wings, 2010. Mi Young's works have focused on the idea of refinement and restriction through drawing of lines. Her emotions can be discovered through the flexible and fine lines. She has tried to discover the essence of feathers flying floating freely in space. And the lightness of existence can be a path to freedom, and also the energy flows without restriction. Celebrated in over 80 countries, International Women’s Day is a unique opportunity for expression and dialogue about the social, cultural, economic and political issues that concern women today. Words of Wisdom is the second exhibition from the W Project, scheduled again to coincide with International Women’s Day. Jeongeun will participate in her second W Project exhibition with her own words of wisdom. The exhibition opens with a private view on the 8th of March 2012 at The KK Outlet in Shoreditch. Events taking place alongside the exhibition include a symposium dinner featuring talks by women who have succeeded in their creative field, a film screening and a youth workshop. Jeongeun just has finished the final edit of Rise above which was shot on Red last summer. She has been working with a music composer Lucy Claire Thornton from Royal College of Music who has been working with Jeongeun three times since last year. Additionally, Jeongeun is working with VFX company, Peerless Camera Company, based in Covent Garden, London. The VFX company has been exteremely helpful to her and is currently working on some visual effects for the film. Jeongeun is aiming to make a master of the film in early February this year. Jeongeun's new film, Rise Above, has finished filming in Jeju island in Korea. Actors Bu-seon Kim from Lady Vengeance and Tae kyung Oh from Old Boy play two people meeting for the first time in strangely uncomfortable circumstances which become clear during their ascent of Saraoreum. Both crew and actors hiked Halla mountain for three days to shoot the film from the 31st August until the 6th September. In an extremely difficult situation shooting on the mountain, all crew and actors collaborated brilliantly with professionalism and huge creative input for Rise Above. 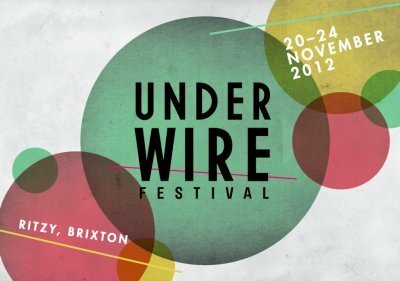 Jeongeun is now editing the film in London, aiming to finish in February 2012. 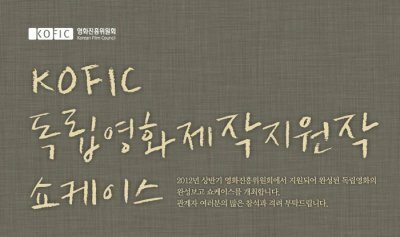 Jeongeun's musical film script, The 38th Parallel, has qualified into the 2nd round of The British Short Screenplay Competition 2011. The 38th Parallel is a musical film based on a simple and cute love story between two street cleaners who work on the border of Camden and Islington. The 38th Parallel is the line of latitude that makes a border between N. Korea and S. Korea. This film is set in London with British characters and is based on the situation of N. Korea and S. Korea as a metaphor in this fable. Jeongeun's new film, Rise Above, was selected as a part of the Independent Short Film Funding programme 2011 by The Korean Film Council. 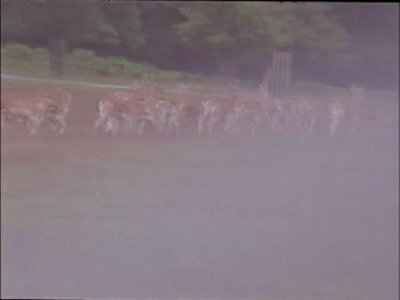 The film follows one guy and his girlfriend's mother as they make an ascent of Saraoreum, a volcanic mountain with a lake at the summit. Jeongeun is planning to shoot in this Summer in Jeju island, her hometown. Jeongeun Choi participated with the W Project with the Kodak Commercial Awards 2011 work, Natural Beauty. 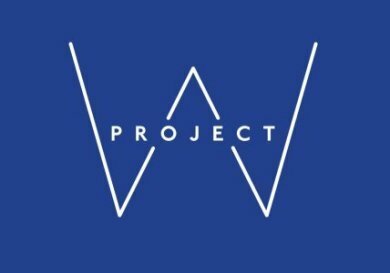 The W Project celebrates women working across the creative industries. It aims to promote empowering role-models and help build a better creative community for the future. Launching on the 8th of March 2011, the project marked the 100th anniversary of International Women’s Day, with an exhibition of work by established and emerging female talent across multiple creative disciplines. 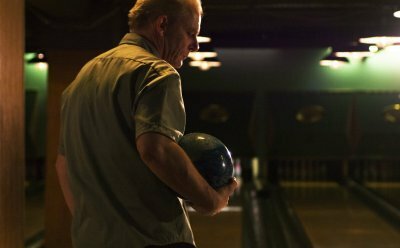 Spare (2min 55sec) is a story a tenpin bowler who is practicing by himself in a bowling alley. Spare is inspired by a painting, Wheat Field with Cypresses, 1889, by Vincent van Gogh. The feeling of agitation in the painting come in part from the mass of twisting lines, dynamic curves and colours repeated several times throughout, and this characteristic is what inspired the choice of professional bowling as an activity. The film was shown at The National Gallery in last March. Jeongeun Choi was selected as one of a shortlist of 20 in the BBC's Creative Climate Short Film Competition. She pitched her project called A Flock of Seagulls at the BBC in April. Her idea came from hearing news about the discarding of fish after caught by fisherman in UK. She pointed out the problem which is caused by The European Commisions which has developed regulations in an attempt to preserve marine ecosystems. She considers the discarding of fish in such huge numbers as unethical, a waste of natural resources, a waste of fishers’ efforts and as having a destructive effect on marine ecosystems. It is clear that the discarding of unwanted fish on this scale is both an ecological and an economic disaster, and is undermining the future of the fishing industry. 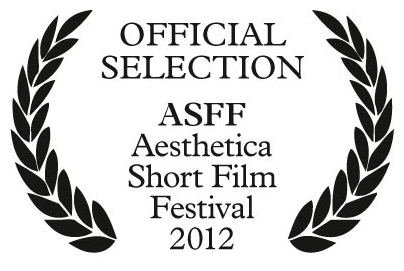 Natural beauty was made for the Kodak Commercial Awards 2011 which was a competition for student filmmakers in the UK. The competition was open to all students who were studying on media or Television course in the UK. Jeongeun's script was chosen and all camera, lighting equipment and budget was provided by Kodak, Soho Images and the London Film School.